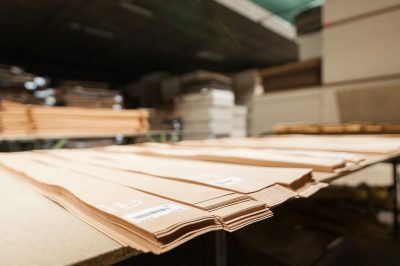 We process sliced veneers of all types of wood from around the world (Europe, America, Africa etc.) with a thickness ranging between 0.6 mm and 3 mm. We have been using glue to bond our sliced veneers for several years now. Thanks to our new pressing line, we are now able to meet all customer needs in terms of both sizes and gluing: we can use both urea and vinyl glue, and we can also colour the glue for special applications. Our new sanding line, with the latest innovations for panel finishing, was commissioned in 2017. A new automatic strapping line was installed at the same time. Nuova Complat allocates a budget for technological innovation every year. Our sanding and automatic strapping line was completely renovated in 2017. 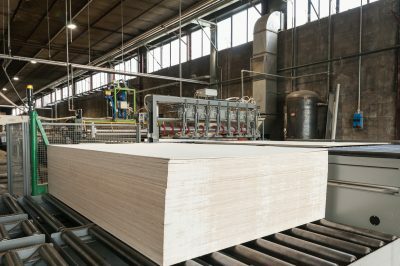 A new cutter was purchased in 2018 to be able to use 3-mm thick sliced veneers in our production process. In addition, with “Industry 4.0” we are making our whole ordering process digital from receipt to shipment, to guarantee complete traceability of our products.